Pinkadots Elementary : Showing Understanding through Narrative Comic Strips! Showing Understanding through Narrative Comic Strips! Just fifteen more days and we can call it a wrap on the 2014-2015 school year. Bring on summer vacation... I mean summer school! We've been busy finishing up our current units in fourth grade. In Science, we are learning about the water cycle. I absolutely LOVE teaching my students factual information that they have never learned before, I LOVE blowing their minds with crazy information that they don't even believe is true (until they research it on their own), and I love positive parent emails that tell me how excited their child is about our current topic in class. Believe it or not, I never thought the water cycle could be so exciting! Since it is the end of the year, my students are taking on more of the learning on their own. To teach the water cycle, we completed a technological jigsaw. I created a Google Doc of links for starting points, put together groups of students, and had students research and explore different stages of the cycle, while taking notes. We then came back together and each group had to teach the class about the cycle. The students LOVED it and the information really sunk in. Since each group took notes from the other presentations, we watched a short clip to check our facts. I found this one on Youtube, which was awesome. As soon as the clip started, my students started to freak out and the room filled with most of them yelling "Whhhhhhat!????" in disbelief. I taught them how to put their hands on their heads and then puff their hands up into the air, to go with the expression that their mind was blown with this new information. Of course, this was silly, but fun. They were all excited to go "blow their parents' minds with this information at home". 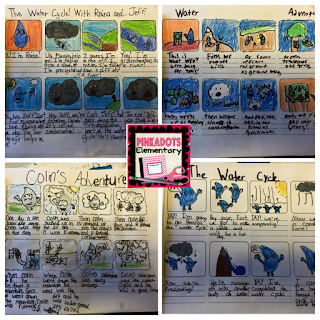 The next day students were allowed to use their notes to write a comic strip from the perspective of a raindrop traveling through the water cycle. It took some planning and a few drafts, but the students had a blast with this activity. I was so excited with how these came out. I actually want to keep them and make a booklet for next year's class to look through. The students did an excellent job of incorporating academic vocabulary into their comic strip. Their goal was to use at least six new vocabulary words and fill up all eight boxes. I've scanned all of the projects and tomorrow each student will present their slide in a slide show on the Smart Board.